This book will be an enlightening and motivational study for every child of God who desires to become a soul winner. What is a soul winner? A soul winner is a specialist; in the art of making the gospel clear to the lost person and tactfully drawing the net. This book is not required for FBC students, but is highly recommended. 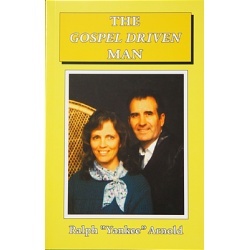 Since the purpose of this book is to motivate and instruct soul winners, this book is written for the sake of the lost man. I don’t believe we can win the world to Christ, but I do believe we can reap a harvest. Therefore it behooves every leader in Christian work to firmly determine that he will produce soul winners. We are training soldiers for the most important warfare in the world, a spiritual warfare for the souls of men. One of the strongest deterrents to becoming a soul winner; is a lack of confidence which results from a lack of knowledge. This book is designed to assist EVERY child of God to be an effective soul winner by equipping every saint with the greatest power made available to man the Gospel. It explains what the Gospel IS, what it IS NOT, how to PRESENT the Gospel, how to ILLUSTRATE the Gospel, and how to DEFEND the Gospel. It will help you to definitely know from Scripture what God’s will is for your life. This book is a guide to help Christian leaders make the Gospel clear and plain to the lost, and to counteract attempts by others, who are perverting the message of the Gospel. This book will make clear the course and purpose of the Christian life, and will reveal from Scripture the philosophy on how to accomplish that purpose. There is nothing more challenging, stressful, sorrowful, hurtful, discouraging, taxing, or burdensome than the GOSPEL DRIVEN LIFE. There is nothing that causes more divisions, differences, attacks, misunderstandings, eternal consequences, or persecutions than the GOSPEL DRIVEN LIFE. BUT There is nothing more powerful, dynamic, exciting, fulfilling, lasting, enjoyable, and rewarding, than the GOSPEL DRIVEN LIFE. Price includes standard shipping within the continental U.S. Please call for rates to other locations.